With Fatal Revenant (Canada, USA, Europe) being released next week, here's my Q&A with Stephen R. Donaldson. Many thanks to the folks at Putnam for helping me put this one together. First of all, let me thank you for being gracious enough to take some time off your busy schedule to answer these questions. We really appreciate it. That's complicated. One perfectly valid reason is that I wanted to prove to my readers--and to myself--that I could write other types of stories, and write them well. Another is that a significant number of other stories (in fact, twelve books' worth) came to me to be written. But perhaps the deepest, most personal reason is that I was afraid. At my first glimpse of "The Last Chronicles," I knew that it would be astonishingly difficult to write; that as a narrative exercise it would make the previous "Covenant" stories look like a stroll in the park. If this last story is done right, if it fulfills my intentions, it will complete and unify the entire saga. But in order to accomplish that goal I'll have to go far beyond my known abilities, both as a story-teller and as a writer. The prospect terrified me. It still does. The argument could be made that everything I've written since I first conceived "The Last Chronicles" has been an attempt to expand my abilities and resources; to make myself ready for the story I'm writing now. Given your stellar career and the quality of your work, past and present, exactly what aspect of this series made writing The Last Chronicles of Thomas Covenant such a daunting task? On every level, this story is both more complex and more intense than anything I've ever tried to do before. It's like sky-diving into The Abyss. - With THE RUNES OF THE EARTH and FATAL REVENANT now under your belt, do you feel that you have achieved what you set out to accomplish with this series, at least as far as the first two volumes are concerned? So far, I've come closer to meeting the challenge than I thought I would--or could. Unfortunately, the demands (on me) of the story will continue to increase through the next two books. - Without giving anything away, what can you tell your readers about FATAL REVENANT? It's time to buckle your seatbelts. I'm sorry. I don't know what else to say except that I'm going to give this my best shot. Maybe that will be good enough. - Will you be touring during the course of the fall/winter to promote FATAL REVENANT? If so, are there any specific dates that have been confirmed as of yet? - What would you say was the hardest part of the entire process involved in the writing of the various Covenant books? Each new addition reveals yet more depth to a saga which has shown just how rich and complex it truly is. Leaving aside the question of whether or not I can write well enough to do this story justice: the single most demanding aspect of the project as a whole is internal consistency. Consistency of style. Consistency of tone. Consistency of character (and character development). Consistency of theme (and thematic development). Consistency of symbol. Consistency of logistics (is it actually possible to ride from here to there in X days?). Consistency of geography. Consistency of history (an especially complex issue because I don't use a "story Bible" to guide me). Consistency of magic and monsters. And so on. - Have the plotlines diverged much since you began writing the Covenant books, or did you have the entire plot more or less figured out from the very beginning? Were any characters added or further fleshed out beyond your original intention? Have you made any changes to your initial plans during the course of the writing of the three series? My plotlines don't diverge. Not because I'm a "plot" writer (I'm not), but because I can't write at all unless I know exactly where I'm going. In many ways, the destination defines the journey. But I often add characters to my original plans--or emphasize characters in different ways than I had originally intended. In THE RUNES OF THE EARTH, Manethrall Mahrtiir was a late discovery--as was the Mahdoubt. Hmm. That's like asking me what motivates me to keep on living. Writing (storytelling) is what I was born to do. I wouldn't be fully alive if I stopped. - Getting LORD FOUL'S BANE published proved to be a long and winding road for you. How rewarding is it to see that it's still in print 30 years later? It's amazing what you can become accustomed to. 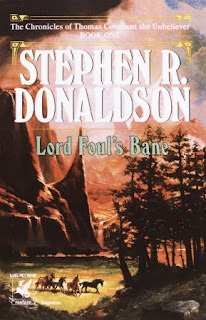 After my vast difficulties finding a publisher in the first place, simply seeing a physical copy of "Lord Foul's Bane" was a transcendant experience. Now everything that I've ever published is still in print--and I take that for granted. I suspect that this does not speak well of me. Ribuld and Argus in "Mordant's Need". No characters before or since have taken me by surprise the way they did. - You have been writing novels for three decades. What has changed the most in the fantasy genre since you began your career? For two decades before I broke into print, there was "The Lord of the Rings"--and virtually nothing else. Six months before I was first published, Terry Brooks made a splash with "The Sword of Shannara". Now we're up to our hips in fantasy novels and series of every conceivable description--and quality. In general, this seems good to me. But it does make it more difficult--you should pardon the cliche--to separate the wheat from the chaff. - What advice would you give a younger Stephen R. Donaldson concerning his writing career? Looking back, would you have done anything differently? No, I would not have done anything differently. But if I could communicate now with my younger self, I would urge that Stephen R. Donaldson to trust himself more. - Many fantasy authors don't read within the genre. Is it the case with you? If not, what authors make you shake your head in admiration these days? I'm a very slow reader, but I do read a fair amount of fantasy and science fiction. Writers whom I especially admire include: Patricia A. McKillip, Steven Erikson, and Tim Powers. - After producing all those bestsellers and selling millions of copies worldwide, after winning literary awards, is there added pressure when it comes to writing new series/novels, knowing that the expectations will always be high? I do suffer from a kind of "performance anxiety" that I associate with competing with myself. So many people enjoyed the first six "Covenant" books--and I've made them wait so long to complete the story--that I can hardly bear the prospect of disappointing them. In the long run, however, I'm more concerned about doing justice to the story. For that reason, I hope that my own expectations for myself are higher than anyone else's for me. - The fact that you have an official website on the internet is an indication that interaction with your readers is important to you as an author. How special is it to have the chance to interact directly with your fans? Actually, my website does *not* indicate that interaction with my readers is important to me. It indicates that my publishers want me to do more to promote my own books. Nevertheless I *do* benefit from interaction with my readers, and I value it. Primarily through conventions, every writer of science fiction and fantasy is blessed with access to his/her audience(s): access which does not exist to the same extent in any other form of literature. As a result, I don't need a website to help me interact with my readers. That said: the interactions on my website are more focused (therefore more efficient? certainly more concrete) than those that occur at conventions. My website has benefitted me in ways that I didn't expect when I started it. I think that the recognition of the best work in our field as serious literature is inevitable--although I don't expect that recognition to come quickly enough to do either of us any good. It is a fact that the oldest and most enduring forms of literature in every language of every culture on the planet are fantasy. This simply cannot be an accident: it has to be an important statement about how human beings find meaning. Well, we live in a cynical time: "meaning" is out of favor. But this phase will pass eventually. Time will ensure that any work which deserves the status of Literature will receive its due. - More and more, authors/editors/publicists/agents are discovering the potential of all the SFF blogs/websites/message boards on the internet. Do you keep an eye on what is being discussed out there, especially if it concerns you? Or is this too much of a distraction? No, I don't visit blogs/websites/messages boards. Indeed, I spend as little time on the Internet as possible. Sure, those things are distractions--not to mention black holes for time. But that's not the primary reason I avoid it. I avoid it because it's bad for me. Poking around on the web trying to find out what people are saying about me sounds a whole lot like middle school; and I really need to be an adult. "Every moment of a science fiction story must represent the triumph of writing over worldbuilding. It's difficult to argue with Harrison's position as he's expressed it here. (Remember, however, that he has assigned a specific meaning to the term "worldbuilding"--a meaning which the term might not have if someone else used it.) Indeed, I would be inclined to go a little further: "Every moment of any literature must represent the triumph of writing over worldbuilding." Or I might re-state Harrison's position to more accurately reflect my own (without, I hope, doing too much violence to his views): "Every moment of any literature must represent the triumph of storytelling over worldbuilding." Of course, we could make the whole issue go away simply by assigning a different meaning to "worldbuilding". But where would be the fun in that? Many thanks again for accepting to do this interview. And thank you as well for all those wonderful novels! We wish you continued success with your writing career and best of luck with the forthcoming release of FATAL REVENANT. wow! good interview Pat!! I'm so glad he responded and you got this! I can't talk for Fatal Revenant yet (some of us don't have the book yet! ppllsst!) but he sure didn't disappoint me in Runes of the Earth, and I don't expect to be once I get Fatal Revenant! ..and that wouldn't be pressure on him because I love the characters and story so much that he can't go so wrong as to make me think the book isn't good. Very few authors go on to other writings and come back to what made them "famous" to begin with.. he's already done this successfully and I wish more would do that. I'll get around to reading the Last Chronicles in a few years (I liked the first two enough to want to read the third when it's nearing completion, but not enough to clamor for each copy as it is being released). I was definitely looking forward to this interview, and it did not disappoint. Thanks! Nice interview, ive been meaning to read his books for a long time now I just havent gotten around to it. on the ridiculous. I certainly never required a dictionary to hand when reading Tolkien as a 10 year old! I have however decided to continue but substitute the nonsense words with made up words of my own, the effect is truly hurgleguam and much more kerambablifying to read that I now laugh my gurnalls off! When Covenant and Jeremiah (Tom and Jerry!) turned up at the end of 'Runes of the Earth' I realised that this last chronicles is really a comic and the author is just ‘taking the piss’.